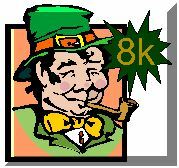 Run the Third Jewel at the St. Paddy’s Day Great Race of the Great Plains 8k on March 15th. Run the Frigid Five on March 22nd Rescheduled due to weather. The overall Triple Crown winners, who receive the DR. TOM CONIGLIONE CHALICE, are the male and female whose total points for their overall finish in each race are the lowest. In the event of ties, the tie-breaker is the finish in the Frigid 5 - whichever runner finishes higher in the March 22nd race is the age group or overall winner. Overall winners do not also receive their age-group cup; it goes to the next lowest-point finisher. Awards are presented at the conclusion of the presentation of awards for the Frigid 5. Enter the Triple Crown for $75 for Landrunner members, $80 for non-members ($50 - 19 & under), which qualifies you for all three races and saves you some money (plus no, zilch, zero, nada processing fee for using online registration). Mail-in registration form by Feb 1st. One last detail: if your age bracket changes during the running of the TRIPLE CROWN, your point totals are calculated from your finish in the age bracket you are in when you run each race. Your TRIPLE CROWN final ranking will be based on the age bracket you are in on March 22nd. Whew! Any questions?